So I upgraded my entire Adobe CC suite to 2017 a while ago and everything was working just fine till last night, (nothing new added, other than bringing over my custom stuff from 2015 when I upgraded). I have two machines where PS CC2017 is dead in the water. Every other Adobe program (6 of which I routinely use from my subscription) is working just fine. Everything in Bridge is synced, color setting etc. etc.. PS slash screen comes up (tries to load) then crashes. I'm getting "PS has stopped working". Did a search on the good ole web and it appears I'm not alone. A few suggestions on fixing but no solution, some have had success in running as admin, disabling hardware rendering (which I can't really do but tried) to no avail. Appears a couple virus programs were causing the problem on some machines which I have none of the ones mentioned. (I use Eset) A few other ridiculous suggestions are out there....which I tried, still NG. So before I call support, anyone getting this and have you found a solution? BTW, yes I have uninstalled PS CC2017 and did a new install, still same issue. Stopped working. FYI, I am an advanced user of PC's. Both running Win 7 Pro, both Laptop and Desktop have more than enough resources. All my 3D cad, ram guzzling programs are running just fine which requires a tad more umph than PS...so pretty sure it's not a resource issue. Thanks in advance for any suggestion beyond what I haven't tried. Go to Accessories, System Tools and System Restore. Go back to the date when it was working. Good luck. Sorry to hear that happened. I have it working on 2 Win 10 machines without a hitch and from what you have stated you have tried, I think you need to call Adobe. That's what I would do in your situation. I understand that Microsoft has stopped selling Win 7 to PC manufacturers which is their first step in not supporting the OS. I don't think that is your problem but their could be a glitch specific to Win 7 or more specifically to Win 7 Pro. Good luck. You've probably found this on your own. There is a thread going at the Adobe sponsored forum and a real Adobe Staff person has started participating. A few people have found solutions. Here is another topic on the same subject.... Some say they are fixing it and some say they are using the Cloud installer to "roll back". Thanks, I know and am trying to avoid that, and shouldn't have to. Restoring a system does necessarily fix the issue that caused the problem, usually only postpones it from happening again. If there is a problem else ware, it should be fixed first and Restore a last resort. I agree, the fact that's is was running for sometime, and Win 7 Pro is still supported so I don't think that's the issue. 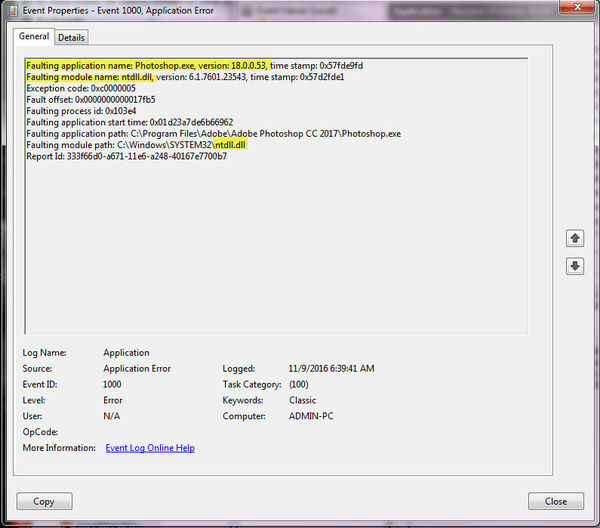 I would think if Win 7 Pro is the culprit, it case would affect all Adobe products I use. It doesn't. Everything else I use works fine. Thanks, but if you notice at the top it says ...."NOT ANSWERED"...I.E. no resolve. Plus It relates to Win 10. I do think it's an Adobe PS 2017 specific issue, so I guess I'll try Tech support. Thanks Bill, yes I came across this, I don't have Lavasoft on my systems, I use ESET Smart Security, which FYI it's never a good idea running two Anti Virus programs on the same machine. I did most of what's mentioned, nothing specific in the Event Viewer either.